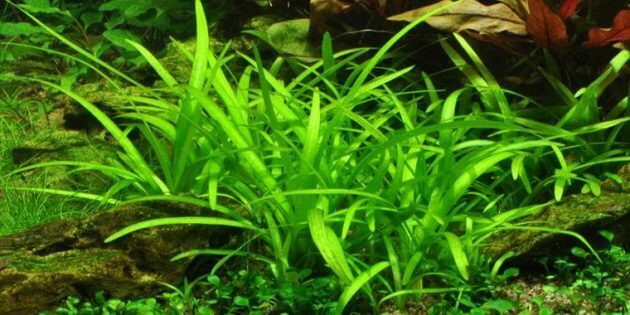 Best Freshwater Aquarium Grass For Planting In Large Aquarium Echinodorus Tenellus or Helanthium Tenellum or Pygmy Chain Sword – Echinodorus Tenellus is one of freshwater aquarium grass plants species which it has a light green hue and frequently have smaller and wider-leaved form. E. Tenellus native to North America. In submerged form, they always have bright green hue, nevermore reddish, up to a little over two millimeters wide and widest below the middle. 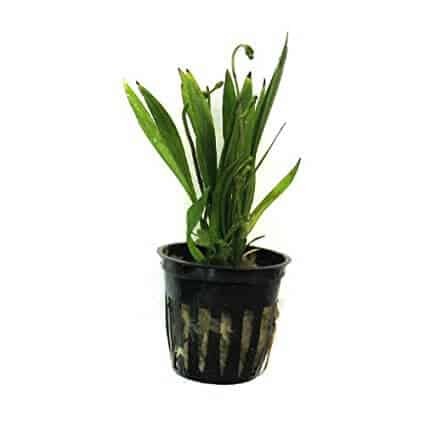 Today this plant sold in trade under the name Helanthium Tenellum. This plant ideally placed in between rocks because it’s feathery-like, slightly wild looks an excellent softening effect that makes a warmer and more subtle atmosphere. But, if you want to make your rocks work to seen very dramatic, Eleocharis parvula maybe a better choice to achieve that look. 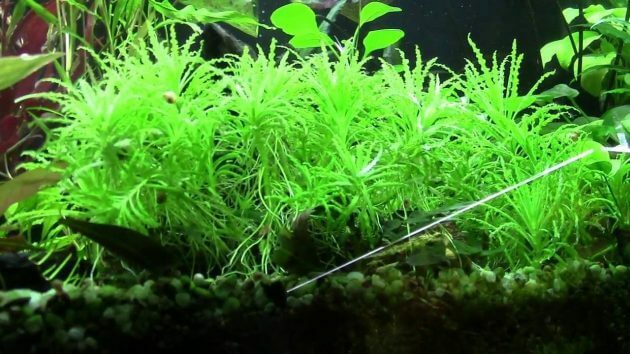 This plant commonly used for carpeting aquarium ground with medium to large size, but it can also apply to nano tanks and still give great effects too. 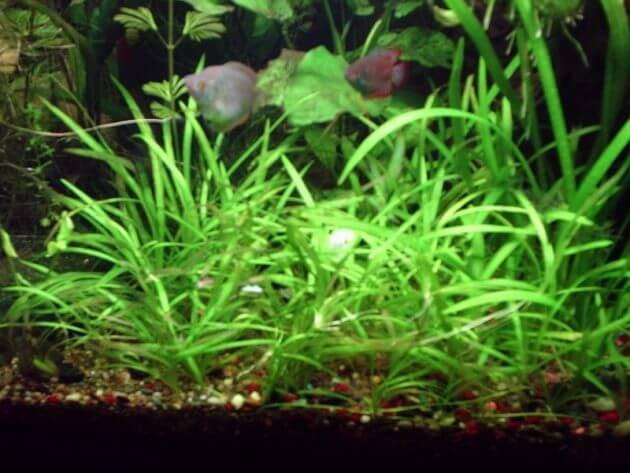 In nano tanks that will work as well when placed in the background where the foreground areas are covered entirely by smaller carpet plants such as Montecarlo, Hemianthus callitrichoídes ‘Cuba’ or Mini Hairgrass. 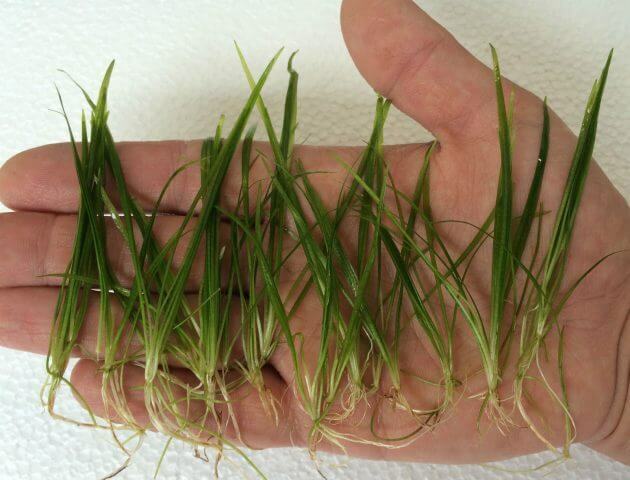 E. Tenellus grows by sending out runners, that why this plant become a great carpet plant which can shape a very dense carpet in tanks. That plants grow quickly and can be achieved great result in short time periods. It will become most excellent carpet and shows a great view if you injected CO2 system, sufficient lighting and regularly fertilizing because it’s critical. If the algae thrive on the plant, simply cut off the affected leaves and remove them from the tanks. 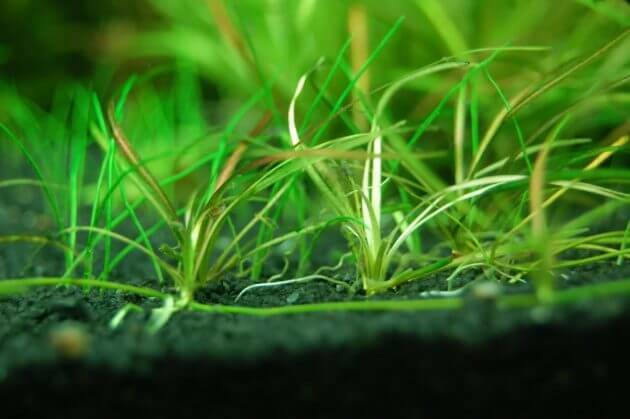 Echinodorus tenellus is the freshwater aquarium grass plant whose trapped in the ground, so they need materials substrate with rich micronutrients for maximum fertilization. 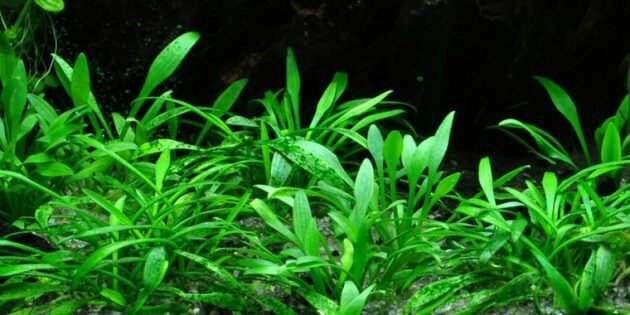 ADA Aqua Soil Powder Type is especially useful for carpeting plant types and another small aquarium plant because this substrate type has tiny granules size allows the plant portions to be placed into it safely. Besides it, the benefits of small granule size, let the roots of that plant to investigate it quickly and the plants will grow healthier, faster and stronger. Plant them into the substrate with pinsettes, in the form of the number 5 on a dice. Use ADA Aqua Soil Powder type for the best results. Give liquid fertilizer with rich micronutrients such as Seachem Flourish Excel which help the plants stay healthy and strong. Binomial Name: Helánthium tenéllum (Mart. ex Schult. f.) J. G. Sm.